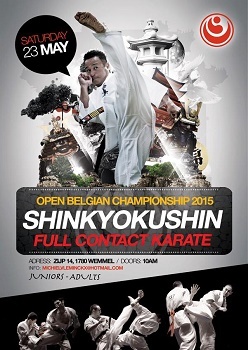 The event will take place on SATURDAY MAY 23rd 2015 in the sports hall Campus Wemmel Zijp 14-16, 1780 Wemmel. • The fights will be held according to the rules of (Shin)Kyokushin kumite. • All fights will be organised in pyramid draws, in which the winner goes on to the next round and the losing opponent is eliminated. • Only if the number of participants in a certain category is too small, a pool will be organised instead of a pyramid draw. • As it is a Belgian Championship we expect the level to be high. • Participants are allowed as of 9 years old. In agreement with our French colleagues, there will be a limited number of adult participants in a full-fledged U24. Participants of 18 to 23 years old can subscribe for this. We happily refer other adults to the French Open on Saturday, June 13th.